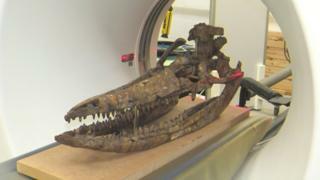 Some 200 million years ago in what is now Warwickshire, a dolphin-like reptile died and sank to the bottom of the sea. The creature’s burial preserved its skull in stunning detail – enabling scientists to digitally reconstruct it. The fossil, unveiled in the journal PeerJ, gives a unique insight into the life of an ichthyosaur. The ferocious creature would have fed upon fish, squid and likely others of its kind. Its bones were found in a farmer’s field more than 60 years ago, but their significance has only just come to light. Remarkably, the skull is three-dimensionally preserved and contains bones that are rarely exposed. “It’s taken more than half a century for this ichthyosaur to be studied and described, but it has been worth the wait,” said palaeontologist Dean Lomax of the University of Manchester. Thanks to data collected from CT scans, researchers Nigel Larkin and Laura Porro were able to digitally reconstruct the entire skull in 3D. “CT scanning allows us to look inside fossils – in this case, we could see long canals within the skull bones that originally contained blood vessels and nerves,” said Dr Porro. The ichthyosaur was originally identified as a common species, but after studying it in more detail, scientists identified it as a rare ichthyosaur called Protoichthyosaurus prostaxalis. There have been previous studies of large marine reptile skulls that have been reconstructed but they are incomplete. “We were also able to digitally edit the original skull, ie move bones around and manipulate them so that they are in life position,” said Dean Lomax.